was delivering the presidential address on the occasion of Birth Centenary Celebration of former female artiste late Smt. Devika Rani who had married the renowned artist being celebrated by the International Roerich Trust at the Art Gallery at Naggar in Kullu valley today. Chief Minister said that the State Government would be providing all help to renowned film star Smt. Hema Malini who had approached him with the proposal to set up a Dance Training School in Himachal Pradesh. He said that Smt. Malini had been suggested Kullu valley for setting up dance school which was bound to polish the talents of the young artistes of the State. He informed that renowned Punjabi singer Shri Hans Raj Hans had also made a similar request which too was welcomed by the State Government to set up a vocal music training school in Himachal Pradesh. Prof. Dhumal said that former Prime Minister Shri Atal Behari Vajpayee had visited the Roerich Art Centre during his Prime Ministership and sanctioned a sum of Rs. two crore for the improvement of the centre. He said that Shri Vajpayee was himself a great admirer of art and culture and was always prepared to do his best for the promotion and preservation of art and culture. He expressed gratitude towards the generous attitude of Shri Vajpayee for his liberal financial aid to the centre. Chief Minister said that late Devika Rani the great grand-doughter of Noble Laureate Rabindra Nath Tagore happened to be the first female actor of the Indian silver screen who broke the myth of male dominate film industry. He said that late Smt. Devika Rani was the pride of India and pioneer in encouraging female artists to exhibit their acting talent and make them mark in the film world. He said that late Smt. Devika Rani introduced many a prominent stars of yester years to the silver screen. He said that late Shri Ashok Kumar, Dalip Kumar and many other heros among dozens of top stars who were introduced to film world by late Smt. Devika Rani. 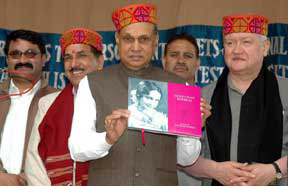 Prof. Dhumal said that state offered peaceful and most congenial atmosphere for the promotion of art and culture that was why late Shri Nicholas Roerich had settled at Naggar, in Kullu valley. He said that the place achieved international recognition with the opening of art gallery in the village. He said that the real tribute to late Sh. Nicholas and Smt. Devika Rani would be that both the countries endeavour for cementing the bonds of bilateral relations. He said that India and Russia had very old friendship which would get strengthened with the activities organised to mark the Birth Centenary celebrations of late Smt. Devika Rani. Chief Minister also released the book “Queen of the Silver Screen” compiled by Dr. Alena Ducter of the International Roerich memorial Trust. Later Chief Minister also listened to the public grievances at Naggar castle, where he was also accorded a warm reception on his arrival in the village. Shri V.I. Trukinikov, Russian Ambassador in India, said that the birth centenary of late Smt. Devika Rani, wife of eminent painter late Svetrolar Roerich, who had settled at Naggar in Kullu valley and introduced the painting art to the world from his Kullu valley residence, was also celebrated at Bangalore as well as in Russia. He said that the late artist had been instrumental in giving new identity to the art and culture. He said that Himachal Pradesh had been blessed with immense natural wealth which had attracted Mr. Roerich to settle down here and work for the promotion of art in the most peaceful and congenial atmosphere in Kullu valley. The Russian Ambassador paid his glowing tributes to the Ist lady of Indian Cinema on her centenary birth celebration. He narrated the efforts and contributions made by her towards the Indian Cinema. He said that late Smt. Devika Rani was also popular in Russia and was ambassador of cultural promotion activities the world over. He thanked Chief Minister for his keen interest in the art promotion activities of the Roerich Art International Trust at Naggar. Shri Peter Deplay grandson of late Smt. Devika Rani also shared the memories of the yester years and said that his grandmother loved to stay in Kullu valley. He said that India and Russia were old friends and such celebrations would further strengthen the bonds of friendship between both the countries. Shri Govind Thakur, MLA, welcomed the Chief Minister and thanked the State Government to organize the Birth Centenary function at Roerich Art Gallery, Naggar, which was a great moment to art lovers of late Roerich and Devika Rani. He said that it had brought the valley again on international art map. Dr. Alena of the International Roerich Trust, proposed vote of thanks and read out messages of renowned world personalities sent to mark the Birth Centenary Celebrations. Variety cultural programme was presented by the Russian and Indian artists to mark the celebration.Pt. Khimi Ram, Deputy Speaker, H.P. Vidhan Sabha, Shri Govind Thakur, Shri Kishori Lal MLAs, Sh. Kunj Lal Thakur former Minister, Sh. Ram Singh, President District Kullu BJP, Dr. Reeta Singh, President, Akhil Bhartiya Sahitya Parishad, Sh. Jatiana Kririsanfova Ist Secty, Vladimir Khrisyov, Ist Secy and Rozovskiyfedor Councilor in Russian Embassy in India, Sh. J.R. Katwal, Director Information and Public Relations, Smt. M.Sudha Devi, Deputy Commissioner, Sh. Jagat Ram S.P., Sh. S.S.Negi Conservator of Forests and other prominent people were present among others.